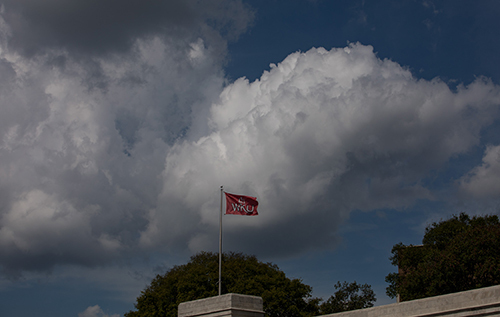 Welcome to Today@WKU, the daily newsletter from WKU Public Affairs, for October 10, 2018. Mary Ellen & Jim Wayne Miller Celebration of Writing Oct. 28: For 21 years, Professor Mary Ellen Miller organized The Celebration of Writing as a way to honor Jim Wayne Miller’s career as a renowned author, poet and teacher. After Professor Miller’s death in June, the WKU English Department renamed the event The Mary Ellen & Jim Wayne Miller Celebration of Writing to honor her life and work, alongside the work of her husband, and created an endowment fund to support The Celebration. Gallery Hop at the Kentucky Museum: The Kentucky Museum will participate in the Bowling Green Gallery Hop and will be open extended hours on Friday (Oct. 12) from 5-8 p.m.
What’s Happening at WKU: Check out a list of events through Oct. 27. Football: Practice Report: WKU Football ran a spirited practice on Tuesday evening in preparation for the team's upcoming opponent, Charlotte, after the bye week. The Hilltoppers and 49ers square off Saturday at 2:30 p.m. CT in the Queen City. With senior quarterback Drew Eckels recovering from injury, all three of the other Hilltopper quarterbacks are competing this week in practice. Reaching the finish line: WKU Professor's involvement in 10K nears 40-year end: Making a commitment to something for nearly 40 years is never an easy task. It takes a true passion to be devoted to one thing for that long of time, and it's something Dr. Carl Kell is all too familiar with. Sculptor Patrick Dougherty Guides Volunteers in Stick Sculpture Project at Kentucky Museum at WKU: A community art project in Kentucky involves tramping around in the woods and cutting down young trees to create a large-scale sculpture made from sticks. The WKU project is led by a sculptor whose studio is the outdoors. WKU student from Shepherdsville to appear on 'Who Wants to be a Millionaire? ': A WKU student is making a play for some major cash this week. Rebecca Price, a WKU sophomore from Shepherdsville, will appear this week on the popular game show "Who Wants to be a Millionaire?"